Most who listened to the original Old Time Radio broadcasts subscribed to an Abrahamic faith, one of the monotheistic religions which descended from the prophet Abraham. The first of these faiths was Judaism, the Hebrew faith based on the teachings of Moses, handed down in the writings of the Torah. Christianity is based on the life and teachings of Jesus of Nazareth as related in the New Testament. There are other Abrahamic religions, but their adherents had little influence on American radio. As a tool to reach out to the people, radio was seen as useful as the printing press was to those who printed the earliest Bibles. Not all of those who used radio to spread their message were considered the best representatives of their faith. Some were disreputable at best, and others were downright crooked. A few seemed to use radio to spread a message designed more for personal profit than praising God. Other radio religionists delivered a message that bore a message which reflected the best ideals of their faith. Very often these were more than a celebration and sharing of God's blessings, they reflected some of the best programing in radio. 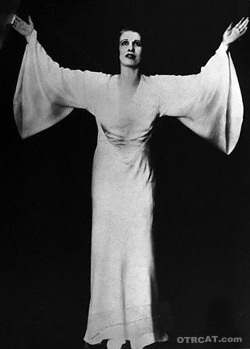 Aimee Semple McPherson was one of the earliest evangelists to discover the power of radio. She was able to reach and minister to a large flock. Her ministry, which was financially very lucrative, was touched by scandal. In 1926, McPherson disappeared while swimming near Venice Beach. She was presumed dead, but later found wandering in the Mexican desert. There was evidence that she spent the time with a married boyfriend in Carmel-By-The-Sea. In 1930, Father Fulton J. Sheen began a Sunday night broadcast called The Catholic Hour. The program enjoyed the support of The National Council of Catholic Men and featured excellent religious music along with religious and intellectual discussion. Among the themes Sheen explored were Catholicism in government and the War as a religious, as well as a political struggle. Fr. 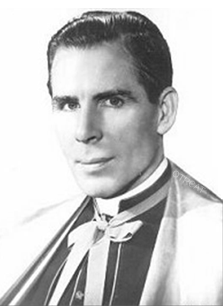 Sheen would be consecrated as Bishop in 1951, in 2012 the Vatican recognized Sheen's as a life of "heroic virtue", a step toward eventual beatification. Father Charles Coughlin made more inflammatory use of the radio and was a more controversial Catholic figure. Coughlin began broadcasting in 1926 in response to KKK cross burnings on his parish grounds. The microphone became a useful tool for Coughlin, and soon he had a national audience. Many of his broadcasts were more political than religious. He was an early New Deal supporter, but moved away when it interfered with his anti-Semitic feelings. He fell from favor when he began supporting some of the policies of Hitler and Mussolini. 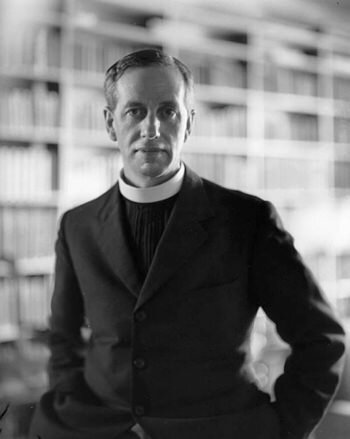 English priest Ronald Knox was an Anglican and Catholic scholar who made many broadcasts for the BBC. He is noted for creating radio's first great "hoax" in his 1926 show "Broadcasting from the Barricades". The program was a supposed report of London being overwhelmed by revolutionaries and may have been an inspiration for Orson Welles 1938 War Of The Worlds broadcast. 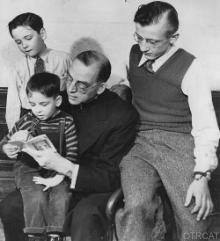 One of the most famous American Catholic acts was the orphanage called Father Flanagan's Boys Town. Tales from "the city of little men" always included a reminder "no boy is a bad boy". The Eternal Light was a cooperation between NBC and the Jewish Theological Seminary. Beginning in 1944, the program was originally part of the network's Sunday morning religious programming, presenting dramatizations of stories and lessons from the Torah and other Jewish writings. The program was part of the radio line-up until 1968 and on Sunday Morning television from 1952 until 1989. The Old Fashioned Revival Hour and Radio Revival Heart to Heart Hour were both part of Pastor Charles Fuller's ministry from the Los Angeles area. Fuller had been an orange grower but found his calling, first in the leadership of the local Presbyterian Church, and later as a Bible School teacher at the Calvary Church in Placentia. At a conference in Indianapolis, he was invited to speak on a radio program in 1927. Realizing the reach of the new medium, he began his radio ministry in California. 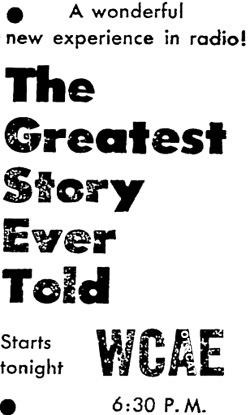 The Greatest Story Ever Told was a radio series which ran from 1947 until 1956, based on stories from the gospels. The program used the highest of radio production values and was highly popular. In 1949, Reader's Digest editor Fulton Ousler adapted several of the scripts into a novelization. Rights to the novel were bought by Darryl F. Zanuck for 20th Century Fox, but never put into production. Director George Stevens formed a company to make the film, and the Technicolor epic was noted for its ensemble cast. Be the first to comment on "Religious Broadcasts in Old Time Radio"